Dr James Maxlow was born in Middlesbrough, England in 1949. His passion for geology no doubt was inherited from a family history of “ironstone workers” supplying iron ores mined from the Cleveland Hills, south of Middlesbrough, to the foundries and steel rolling mills of Middlesbrough during the 1800s. After initially working as a mine geologist in Victoria, a brief sojourn into surveying, survey drafting, mine surveying and home building again saw James return to geology, this time in the Northern Territory and later in Western Australia. His varying work experience being directly attributed to the fluctuating stock market and mining economy at the time – an unfortunate side effect of the profession. James spent in excess of 25 years working as an exploration and mine geologist throughout much of Australia, gaining valuable field experience and knowledge, which he has since applied to research into his other passion – Earth Expansion. Klaus Vogel (left) and James Maxlow (right) displaying and comparing their Expanding Earth models at Klaus’ home in East Germany (1997). James’ first globes are displayed on the table, and james is holding Klaus’ famous globe-in-globe model. James’ interest in Earth expansion stems from working in the Pilbara region of Western Australia. The Pilbara region is a huge, ancient domal structure, several hundreds of kilometres across. There, 2,500 million year old iron and silica-rich sedimentary rocks form the largest deposits of iron ore in the world. What was so intriguing to James was that the bedded sediments, right down to finest sedimentary laminations seen in the iron ores, could be intimately correlated between widely separated sites for distances of over 300 kilometres. James’ studies showed that, in the central portion of the Pilbara domal structure, some 30 kilometres of sediment and volcanic rocks had been eroded away. It occurred to James that this domal structure may have been a preserved fragment of the ancient Earth, with the dome reflecting the radius of the ancient Earth. It took a further fifteen years of working and raising a family before circumstances allowed James to return to University. Amidst a barrage of academic intolerance he gained his Masters in geology in 1995, followed by a Doctorate of Philosophy in 2002 at Curtin University of Technology, Perth, Western Australia, including a letter of commendation from the university Chancellor for thought provoking original research. During his academic years James met and communicated with many wonderful “expansionists” from around the world. Most notable of which was the late Professor Sam Warren Carey from Tasmania, the father of modern Earth Expansion, Yan Koziar from Poland, and Klaus Vogel from Germany, the father of modern Expanding Earth modeling studies. It was during his academic studies that Professor Carey “passed on” his Expanding Earth baton to James, an honor that he most cherishes. Since his academic studies James has been actively involved with spreading the merits of Earth Expansion, with conferences in Japan, Athens and Australia to his credit. He has published a book on Earth Expansion (“Terra non Firma Earth” available fromTerrellaPress@bigpond.com) and is involved with production of software and DVDs to further promote Earth Expansion as a viable alternative to current tectonic theory. 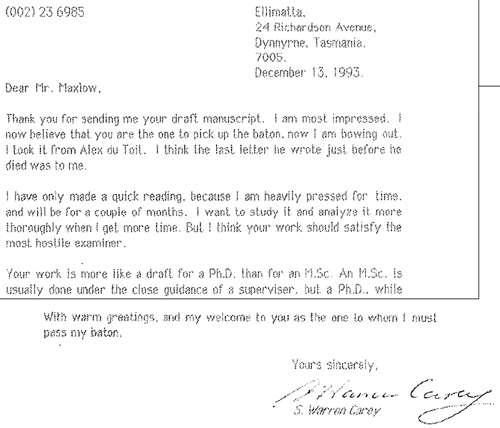 Letter (1993) from Professor Carey making comment on James’ M.Sc. manuscript, and offering to pass on his Expanding Earth baton.